I Want Some Bacon! 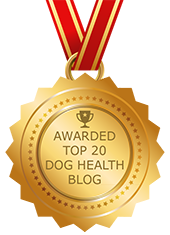 Fat In Dog Nutrition | Dawg Business: It's Your Dog's Health! Ok, so bacon isn't the best thing to feed your dog, although I'm sure he wouldn't complain. But what about fat in general? Should there be fat in your dog's diet? “There better be,” says Fido. Even though his motives might be questionable, Fido is right. As much as fat often gets frowned upon, it does play an important role in dog nutrition. Fat not only makes food more palatable/appetizing, it is an important component of a healthy diet. While the terms fat and fatty acids are often used interchangeably, fatty acids are really structural components of fat much in the same way as amino acids are structural components of proteins. There are usually three fatty acids in a fat molecule, hence another name for common types of fat, “triglycerides”. Most fat in food as well as in the body are triglycerides. Fats fall into two general categories: saturated and unsaturated. 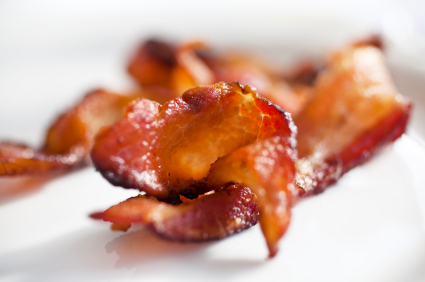 Saturated fats are mostly of animal origin. They are typically solid at room temperature and their main role is to serve as a source of energy (think lard). Unsaturated fats are usually of plant origin. They are liquid at room temperature (think olive oil). For more detailed information about fats, check out Dr. Huston's article Dietary Fat Content and Its Role in Canine and Feline Nutrition. The most obvious role of fat in dog nutrition is to serve as a concentrated source of energy. Fats contain more than twice as many calories per gram as compared to proteins or carbohydrates. The nutritional availability of fat-soluble vitamins depends on guess what? Fat. There are three fat-soluble vitamins that are essential to dogs. These are vitamins A, D and E. As the term fat-soluble suggests, their absorption directly depends on the presence of fat. Without some fat in the diet, these vitamins won’t be absorbed well even if they are present in adequate amounts. Linoleic acid is really the only fatty acid that is considered by AAFCO as essential in dog nutrition because dogs cannot make it within their own bodies. It is an unsaturated omega-6 fatty acid. Linoleic acid is vital for growth, healthy skin and coat, kidney function, reproduction, and other body processes. It is also a constituent of cell membranes and plays an important role in immune function. There are many sources of linoleic acid, but a good one for dogs is safflower oil. While omega-3 fatty acids are not officially considered essential, they are known to be beneficial for dogs because of their anti-inflammatory properties. A great source of omega-3 fatty acids for dogs is fish oil. To find out more about omega-6 and omega-3 fatty acids check out the Nothing Fishy About Omega-3 Fatty Acids article. Fats also help transport nutrients and other substance across cell membranes, contribute to the formation of bile acids and some hormones. For more details check out Dr. Huston's article Dietary Fat Content and Its Role in Canine and Feline Nutrition. There is also a very interesting article by Dr. Stanley Coren taking a different view on the importance of fat in dog nutrition, Why Do Dogs Love Bones? The Answer Involves Fat, Climate and Evolution. You might want to check it out. Balancing fats in dog nutrition isn't particularly difficult, but there are some considerations. 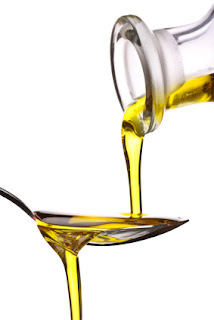 A balanced recipe needs to contain an adequate amount of linoleic acid. If you're using animal protein in your dog's recipe, even a lean source naturally contains some saturated fats. There is nothing wrong with that. The amount of calories you want to come from fat in your dog's recipe will vary depending on your dog's age, health and activity level. The AAFCO recommendations are for a minimum of 5% for maintenance and 8% for growth and reproduction. 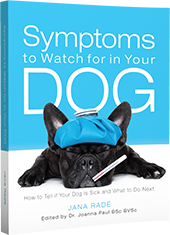 The appropriate percentage varies depending on your dog's health and activity level. Individual considerations are always important. Once you have adequate amounts of linoleic acid in your dog’s diet, you need to consider omega-3 fatty acids. Balancing omega-6 and omega-3 fatty acids is a bit trickier because they mutually compete for absorption. The rule of thumb is that a healthy dog benefits from a ratio of between 5:1 and 10:1 omega-6 to omega-3 fatty acids. Depending on your dog's health condition a different ratio might be called for. Feeding Your Dog: Commercial or Home-cooked? Thanks for this excellent article and the provided links! We shifted recently to Orijen Adult for dog food. And I thought it was a good idea to compare with the info in the article. The omega-6 to omega-3 ratio is 3:1, I will have to do some more investigation why this is, and if it is good enough. The linoleic acid was hard to find, which made me worry as it was considered essential, also there was no safflower oil in the ingredients list. But then I found that Orijen Adult uses Black Currant as their source for linoleic acids. Higher omega-3 ratio is often used for dog with allergies, arthritis and other inflammatory conditions because of the omega-3 anti-inflammatory action. Jasmine's ratio is also different from the general rule of thumb one mentioned in the article, for exactly those reasons (allergies, arthritis, IBD). There are other sources of linoleic acid, I mentioned safflower oil as it is considered the best source. The amount of the oil will be quite low, Jasmine gets 1tsp a day for 1000g of food. That is for certain. We try to pick things that are attractive but still relatively healthy, e.g. we make home-made jerky treats.